The Exchange club of Brunswick recently held their 67th Annual Coastal Georgia Regional Fair. The club held a contest during the fair for each of the 10 local elementary schools. 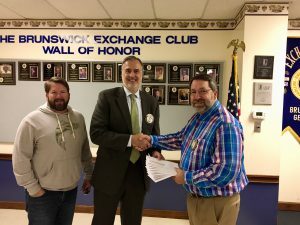 The Exchange Club of Brunswick donated a prize of $500. The schools can use the money how they see fit. The club is making plans to make this an annual program during the fair to help the schools. Pictured from left to right receiving the checks on behalf of the schools are Board of Education member Marcus edgy Dr. Virgil Cole Superintendent of the Glynn county school system and Pres. Kevin Higgins.